we installed IE8 English with WSUS, now we want to make a dynamic collection where we select all pc with IE8 but without IE8-MUI, so we will be able to install the IE8-MUI. 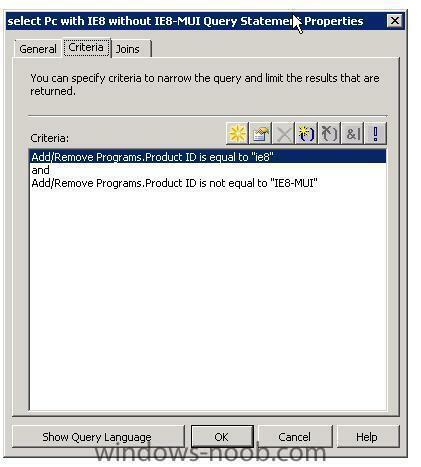 The problem is that after the IE8-MUI is installed, we still having the machine on that collection, that is not what we want. select SMS_R_SYSTEM.ResourceID,SMS_R_SYSTEM.ResourceType,SMS_R_SYSTEM.Name,SMS_R_SYSTEM.SMSUniqueIdentifier,SMS_R_SYSTEM.ResourceDomainORWorkgroup,SMS_R_SYSTEM.Client from SMS_R_System inner join SMS_G_System_ADD_REMOVE_PROGRAMS on SMS_G_System_ADD_REMOVE_PROGRAMS.ResourceID = SMS_R_System.ResourceId where SMS_G_System_ADD_REMOVE_PROGRAMS.ProdID = "ie8" and SMS_G_System_ADD_REMOVE_PROGRAMS.ProdID != "IE8-MUI"
Any suggestion on how automatically delete from that collection, pc that has IE8-MUI already installed? use the criteria not in,that should do the trick here. and here I have a "warning" about valid constant. At the end I was able to do that collection in this way. 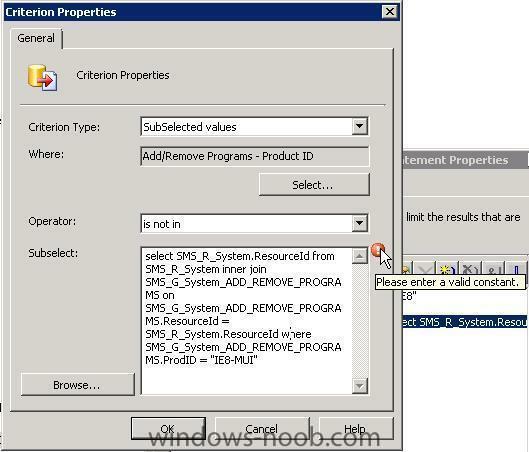 select distinct SMS_R_System.Name from SMS_R_System inner join SMS_G_System_ADD_REMOVE_PROGRAMS on SMS_G_System_ADD_REMOVE_PROGRAMS.ResourceID = SMS_R_System.ResourceId where SMS_R_System.Name not in (select distinct SMS_R_System.Name from SMS_R_System inner join SMS_G_System_ADD_REMOVE_PROGRAMS on SMS_G_System_ADD_REMOVE_PROGRAMS.ResourceID = SMS_R_System.ResourceId where SMS_G_System_ADD_REMOVE_PROGRAMS.DisplayName = "Windows Internet Explorer 8 Multilingual User Interface (MUI)") and SMS_G_System_ADD_REMOVE_PROGRAMS.DisplayName like "Windows Internet Explorer 8"